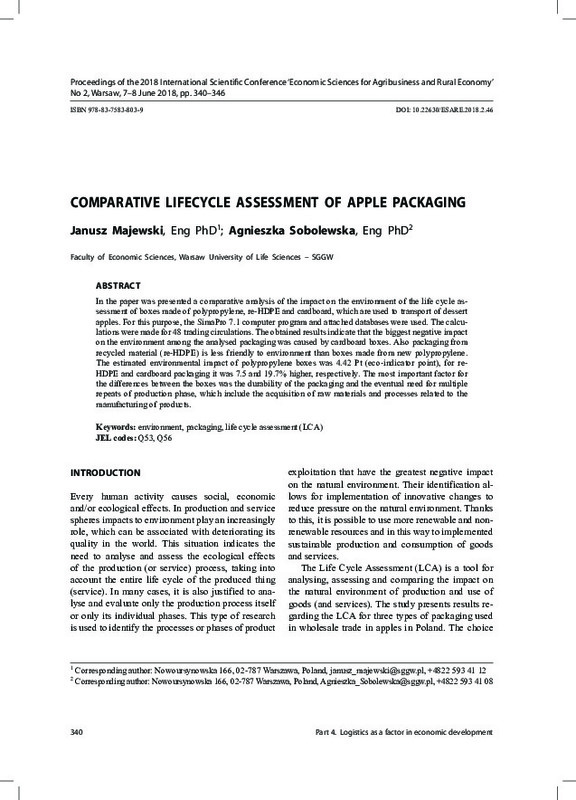 In the paper was presented a comparative analysis of the impact on the environment of the life cycle assessment of boxes made of polypropylene, re-HDPE and cardboard, which are used to transport of dessert apples. For this purpose, the SimaPro 7.1 computer program and attached databases were used. The calculations were made for 48 trading circulations. The obtained results indicate that the biggest negative impact on the environment among the analysed packaging was caused by cardboard boxes. Also packaging from recycled material (re-HDPE) is less friendly to environment than boxes made from new polypropylene. The estimated environmental impact of polypropylene boxes was 4.42 Pt (eco-indicator point), for re- HDPE and cardboard packaging it was 7.5 and 19.7% higher, respectively. The most important factor for the differences between the boxes was the durability of the packaging and the eventual need for multiple repeats of production phase, which include the acquisition of raw materials and processes related to the manufacturing of products.